But I can’t be the only one that found the in-app purchase trigger just a little too easy to squeeze in King’s latest free-to-play phenomenon. It’s built that way, and that’s the entire point. This isn’t a scrappy studio making the game they’ve always wanted to—King’s whole mantra is monetization, and they’re arguably the best at it, turning colorful and oftentimes derivative puzzlers into cash-generating machines. And it obviously works. That sounds cynical, but I’m not bitter at all. In fact, I had a lot of fun matching up candy gems and soda bottles, although the peaks of frustration always seem just a bit too calculated for Soda Saga to feel like a true skill-based game. 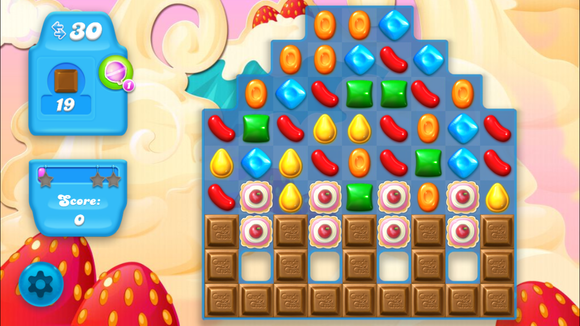 If you don’t clear at least one chocolate square per turn, another is added to the board. And those sweet pastries nearby are multilayered, which means they take several nearby matches to clear. Candy Crush Soda Saga isn’t a dramatic shift away from the original Candy Crush Saga, just as Angry Birds Seasons wasn’t a total reimagining of its progenitor. It’s a similar game with a slightly different theme and a couple of new mechanics. As before, Candy Crush utilizes a familiar match-three puzzle formula, challenging you to link like-colored candy icons to clear them from view. And you’ll have a set number of moves available to complete each stage’s objective, whether it’s clearing chocolate squares from the grid or unearthing large gummy bears hidden beneath ice sheets. Soda bottles add liquid to the screen when cleared, so then new pieces fall upwards from the bottom. This isn’t even the whole stage—there’s another section above. Where Soda Saga shakes things up is in adding even more types of candy pairings, which result in additional special pieces. 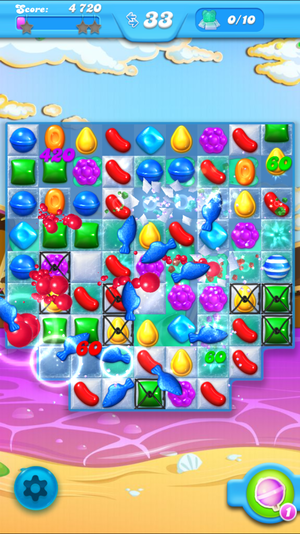 Now you can match four candies together in a square to generate a floating fish—which, when cleared, seeks out a special piece on the board and detonates it. Or, if you match seven like-colored candies, you’ll earn a piece that paints others a single color, typically resulting in a chain reaction of candies blending and disappearing from sight. Also, there are stages that rely on popping soda bottles to make liquid flow into view, which guides pieces upwards rather than down. What that all means is more potential for chaos, although the board layouts conversely seem more constrained than ever. You’re expected to make matches in tight and occasionally twisty boards lined with pastry squares and ice layers that take several nearby matches to clear. Progress comes slow, and too often Soda Saga has to reshuffle the contents as the layouts are too cramped to allow for flexibility in your available moves. 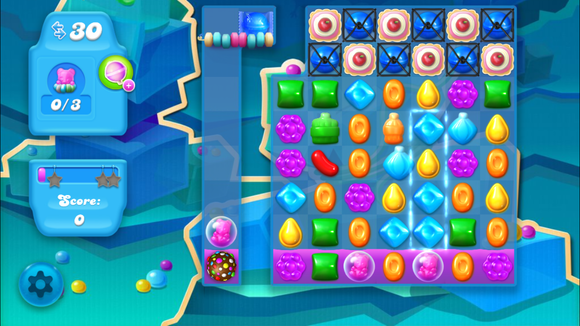 This is what you want to see: several power-ups chaining together at once, breaking away a good number of the candies. It can be rather rare. And that, irritatingly, is a big part of the design—which feels like an intentional move to diminish the experience. That’s where a potentially great puzzle game gets poked and prodded so much that fun is sacrificed to tempt you to pay money. You’ve got a functional free game, but there are times in which the satisfaction of success and victory feels like it’s right behind a paywall, and there’s no other way to get it. But you’re invested. You’ve played dozens of levels. You’re not going to let a few bucks come between you and the rest of the game, right? Like its predecessor, Soda Saga gives you up to five free lives to work with, and they regenerate slowly over time. You can snag more by begging Facebook friends, which is a form of social torture. I couldn’t stomach trying to initiate such a request, so I waited for others to bug me for more lives, and then we continually traded back and forth. You can buy more credits for lives if you need to play more immediately, but that’s not really the punishing part here. Waiting is a reasonable expectation. What’ll wear your down are the limited number of moves allowed in each stage, which you can naturally expand by spending money. That’s where almost all of my money went: I’d play a stage several times and come nowhere near finishing it. But finally, I’d get so close that surely I need just a few moves to complete the objective. Now’s my chance, and adding five more moves only costs about $1 (although if you keep adding moves to a single attempt, the price soars). Isn’t that worth saving potential days of frustration? Yeah, maybe—if you’re exceedingly choosy about when and where you tap into your personal funds. 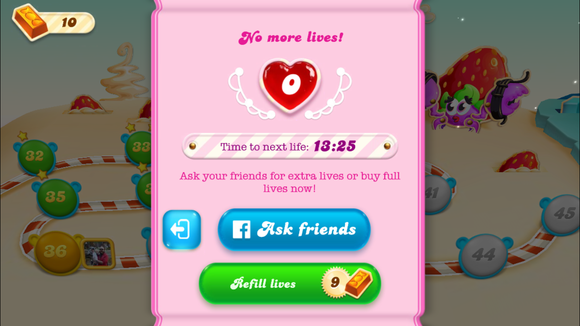 If you can’t wait a couple hours for your lives to refill, you can always pay for gold bars—or beg Facebook friends. Chances are you’ll find yourself in a symbiotic lives-swapping relationship with a couple of pals. The main sticking point is that Candy Crush Soda Saga uses randomized boards: the various candy pieces are never in the same place between attempts, and even the objectives you need to clear—like those hidden gummies below the surface—might be in different locations. Whether they’re truly random or tilted toward the useless is unclear. But success is so often dependent on creating chain reactions of special pieces, and if the board’s contents aren’t set up to allow for such elaborate combos, you’ll get nowhere fast. 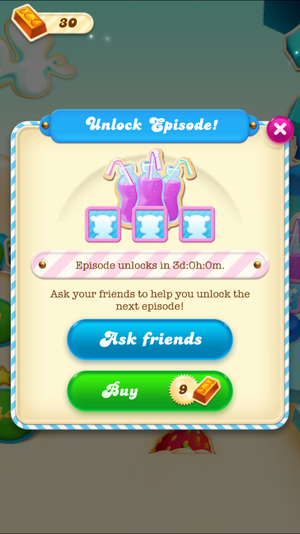 That happens a lot—and Soda Saga’s sudden difficulty spikes come much, much earlier than in Candy Crush Saga. When you win, it feels like luck. And when you lose, it seems like you never stood a chance. When you get tired of the latter sensation, you might spend money to push ahead until the next roadblock. “One last time,” you think. We’ve all been there. Three days? That’s absurd for the game’s first locked-off area (after level 45). I opted to pay in gold bars (nearly $1 worth) rather than poke friends. Or wait, of course. While sad to recount, you have to hand it to King: it’s a brilliantly effective freemium design. And that’s because that Candy Crush Soda Saga is an impeccably designed mobile game: it looks slick, puts a smart spin on match-three puzzling, and the mix of limited lives with challenging stages somehow gives it incredible appeal. I wanted to play constantly, and I needed to push further and further. And that’s exactly how I spent several times more money than I would’ve paid for any premium puzzle game. 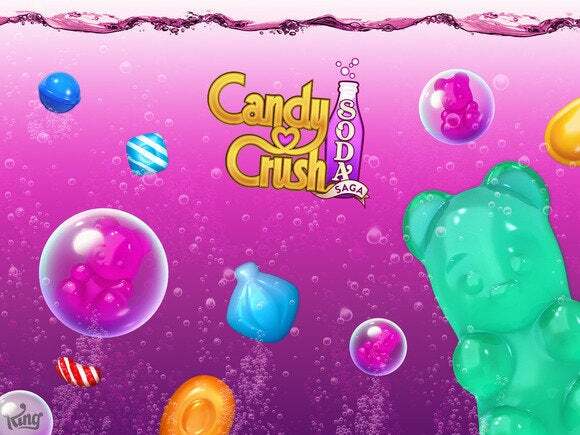 I’m left feeling a little disappointed—in myself for playing into the trap, but also in Candy Crush Soda Saga for not living up to its full potential. 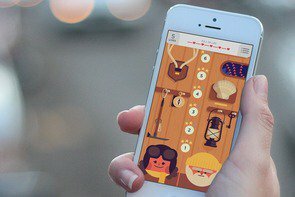 With more of a focus on simplifying and polishing the game design with an eye for fair, challenging levels, it could’ve been one of the best puzzlers on the App Store. Instead, it’s unfocused and inconsistent, with so many different play elements butting heads and too much left to chance. And still I want to play. But a dozen or more hours and twice as many dollars later, I know now that spending big isn’t going to bring me any more satisfaction than waiting or playing something else instead. Or at least, I hope I know that.